While we are located in Toronto, GAO RFID has been successful in creating relationships with our customers in the Philadelphia area and providing them with customized RFID solutions that help solve their business needs. 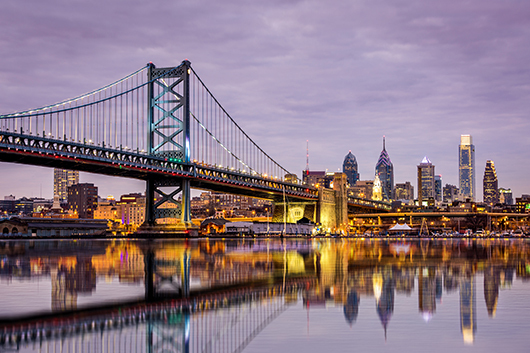 Philadelphia is the economic and cultural powerhouse of the Delaware Valley. The larger metropolitan area covers a vast section of the U.S. northeast. It includes the cities of Reading, Pennsylvania, Camden, New Jersey and Wilmington, Delaware. Some of America’s most prominent companies are headquartered in Philadelphia — like GlaxoSmithKline, Comcast and Sunoco to name a few. The city’s most viable sectors include information technology, biotechnology and food processing. GAO RFID Inc. is able to provide solutions for these industries, and many others in Philadelphia’s vibrant economy. Philadelphia’s metropolitan area has a population of more than 6 million. Each day, thousands of people from the outskirts descend on the City of Brotherly Love for school and work. That is why car dealerships represent a large fraction of local businesses, making vehicle tracking software very popular in this region. GAO’s RFID System for the car dealership industry can expertly manage all your inventory. Our software can pinpoint which cars are least popular, reducing waste and unnecessary re-stocking of undesirable models. Meanwhile, the security component of our System gives users full visibility of all vehicles on the lot. And our RFID tags and readers can check cars in-and-out of the facility in real time, making this System perfect for car rental operators as well. GAO RFID is proud to serve the Philadelphia area. Our team of certified RFID professionals includes innovative thinkers who can solve problems and maximize efficiency. If you’d like more information about our products and services, please get in touch for a customized assessment of your business needs.